Hire a Christmas Office Party Bus to get your party off to a rolling start with exclusive and stylish transport direct from your chosen starting point right to the festive party venue. Hire a double decker bus or luxury executive coach and let us take the hassle out of getting there, knowing that everyone will arrive together, on time, avoiding train delays, expensive taxis or just getting lost. At the end of the evening we’ll then drop you off you safely and securely to your chosen location, so everyone will all be raring to go in the office the next morning (or maybe not!). We are experts in Christmas party logistics planning. 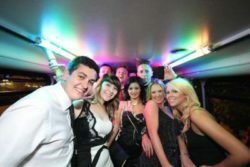 Call us to discuss where you would like your Christmas Party Bus to collect and deliver your team from and to. We’ll work out the quickest or most scenic route, with pick up and drop off times. We have options from one double decker bus to a fleet of buses or coaches. Corporate branding and company advertising packages are available, along with on-board drinks (bring your own or we can supply one of our drinks packages prices from just £5 per head). Enjoy the festive atmosphere with decorations and an on board sound system which you can link to your phone’s music library. It’s your party and we’ll make sure it’s one of the best ever with our professional, slick and reliable service, from the region’s best transport hire company. Whether you are looking to transport company staff between locations, book a bus for a staff party, hire a coach for a company away day, or a corporate training event or meeting, then look no further than our affordable packages and impressive coaches serving London, and the South East.